You may be wondering if a mountain bike is the right type of bike for you to own. The main question that you can ask yourself to decide this is where are you planning to use your bike? If you are planning on staying on paved paths, a mountain bike is probably not for you as you can get away with using a standard bike. A mountain bike is sturdier with an upright frame that has higher clearance and has wide and rugged wheels. This is because a mountain bike is built to withstand everything that you throw at it by riding off the beaten path. One of the most effective ways to make the right purchase the first time around is to do your research. That’s always good advice, but what do you do if you are unsure of where to even start in your search to find the product that will work best for you? Get information and MTB reviews that you can trust on a number of products to help you narrow down which one is the best to purchase. The Diamondback Bicycles 2016 Overdrive HardTail Complete Mountain Bike is a simple design, but don’t let that deter you from giving this one a serious look. I like a good classic design as I know it’s been proven to be effective in the past, and liked enough to continue moving forward with more designs based on it. You can feel confident that the powerful disc brakes and wide tires with knobs will keep you in control of your path through even the most rugged wilderness. These tires are big and will take you where you need to go. The seat and handles are pretty comfortable and will let you ride without feeling like you need to stop because it grows uncomfortable. You cannot beat the fact that this frame is hand built out of quality aluminum alloy while still being lightweight. They accomplish this with the way that the aluminum alloy tubes are formed. You can use the size guide to determine which size bike is going to be the best for you to look into based on your height. The fact that this bike comes almost fully put together with just a few installation steps is very valuable. That means the quicker you pick one out, the quicker you will get out on the open road or backwoods trail. SE Bikes Big Mountain 24-Speed D Hard Tail Mountain Bicycle has all the features you want for a 24-speed bike without a hefty price tag to go along with it. You get a well-constructed frame that is lightweight while still being sturdy enough to take anything you throw at it. It is a double butted alloy frame that is semi-integrated. This means that you will have excellent control of a bike that can take a beating. The tires on this mountain bike are very large at 29-inches and are going to provide you with the best traction possible as you go over a wide variety of surfaces. This means that you will be able to stay balanced and will be able to stop easily no matter the surface. Mud and other tricky surfaces will not stand in your way of a fun ride. You cannot go wrong with the mechanical disc brakes, and the Shimano EZ Fire shifters will make your gear changes hassle-free, even for a newbie. One issue that you may have with this bike is that it does not come with a set of instructions on what you need to do to finish the assembly on it. The good news is that it takes just basic mechanical knowledge to get it up and ready to go for a run. 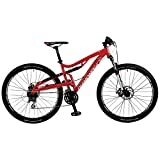 Diamondback Recoil 29er Mountain Bike is another excellent choice for your potential new mountain bike. It is another bike that takes the balance between durability and lightweight materials and succeeds. Plus, you have an excellent rear suspension that is going to keep you from feeling every bump and hump you happen to take your bike over during your rides. Kind shock coil rear shock is an excellent feature to look for if you like comfort to go along with your wild ride. The mechanical disc brakes have you covered for any sharp stops you need to make, and you can feel confident in their braking prowess. This is another bike with the huge 29-inch wheels that are going to let you tackle any challenge that comes your way. These tires have a great tread pattern that is going to bite into the ground to help get you flying, and they also work well for preventing any punctures that could ruin your ride. This is another hand-built frame that you can’t go wrong with if you choose this one. Some assembly is required for this one, but one of the keys to remember is that you need to put the pedals on the correct sides. This is easy to make mistake, and looking for it before you start may save you some headache later. The 2018 Gravity FSX 1.0 Dual Full Suspension Mountain Bike Shimano Acera Suntour is not only a great bike to ride on the hardest trails, but looks nice, too. This bike has a few features that really stand out. The adjustable suspension on the front and rear can make riding this bike like a dream. You will not even notice that you are riding over a rough track with the smooth ride these provide. It also has quick release wheels. This can be a great space-saving feature if you know that space is going to be an issue when you are packing or storing your new mountain bike. You know the frame is durable since it is hydro formed aluminum. The Tektro Novela Disc Brakes are a great addition to this bike, and will give you all the stopping power that you need. You will not have to worry about stopping on that steep incline with these brakes helping you come to a stop. The quality of this bike means that you are not going to have to shop around for another bike for years to come. One thing to note, you will need to purchase a kickstand to go along with your new bike if you want one. The Merax Finiss 26″ Aluminum 21 Speed Mg Alloy Wheel Mountain Bike is a very slick mountain bike that is functional. You’ll be the envy of your riding group with this as your wheels. You may think that this bike is only for looks, and shouldn’t be classified as a mountain bike, but that is far from the truth. The frame is heat treated aluminum that is ready to take on the highest mountain terrain, and also best for entry level mountain bikes. The very cool looking wheels are made out of a magnesium alloy that is lightweight. These come together to make a bike that is going to be responsive and ride like a dream. You will love how light this bike is when it comes time to put it on your bike rack. Add in the mechanical disc brake system that is on the front and rear of the bike, you’ve got great stopping power to help you experience the best ride. This also comes with one of the best shifting systems, Shimano, and you will be pleased with how easy the gears shift for you. All you have is four easy steps to get your bike ready for the trail the day you get it, and then it’s time to get lost on some back trails for a while. Montague Paratrooper Mountain Folding Bike is a bit different from the bikes I’ve covered so far, and you are either going to love this difference or hate it. From the title, you can probably figure out the difference, and it’s that it can fold up. You are able to fold this bike up in under a minute without having to get a tool out of your trunk. This makes it the perfect choice if you are planning on taking this on vacation and need this to be small enough to pack or if you just don’t have a place to keep it in your home. Although it folds, it still remains durable and ready to tackle any of the toughest trails you decide to test it on. This has both front and rear mechanical disc brakes for extra stopping power. The 26-inch wheels are not the biggest on the market, but they are the perfect size for racing up and down the trail. The military heritage of this bike is pretty impressive considering it was originally designed to go along with on a mission with a paratrooper. The unique design of this bike is going to be pretty eye-catching, and you might find you are spending more time telling others about how wonderful the bike is than riding. GMC Topkick Dual-Suspension Mountain Bike is another mountain bike with a unique looking frame that will get people talking. This aluminum frame offers a floating beam suspension that is connected to a Zoom suspension fork. This translates to you having a nice and smooth ride as the spring, and the suspension will help deal with the rockiest of terrains that you want to travel. You will have excellent Promax disc brakes that are in the front and the rear of the bike. This will give you the ability to stop easily, even when there is rain, mud, standing water, and more. This works well in conjunction with the 26-inch wheel. You will be pleased with how well this bike rides for you on the hardest paths you can find. This bike gives you a lightweight and strong bike with excellent brakes, big wheels, and a unique suspension. That’s a great package, and this might just be the perfect mountain bike for you to choose. You may be put off by the fact that this bike will need to be assembled, but there are services that will handle that for you in most areas if you are worried that you wouldn’t be able to do it right. Schwinn Protocol 1.0 Men’s Dual-Suspension Mountain Bike is the final bike, but not the least. Pretty much everyone knows the name Schwinn, and that’s because they are a trusted bike brand that they know what they are doing. They do not disappoint with this mountain bike. It has a dual suspension frame that is aluminum with steel in the rear. It has a front disc brake that is a linear pull. This will get you stopped in any conditions that you might face on the trail. It also offers Shimano trigger shifters for the 24 speeds that make it really easy to find the right gear and get going. The 26-inch wheels will tear up the terrain providing you with the go you need. This is a smooth riding bike with excellent tires that work with the suspension to make even the hardest trail seem like child’s play. Even better is the fact that this should take you a half an hour or less to get your bike fully assembled, and ready to get outdoors to try out your brand new bike. This simple looking bike is going to work well for beginners and seasoned riders as the suspension offer great traction and control. You will absolutely love this mountain bike. It has a light, aluminum frame and double wall aluminum rims for easy rolling. It has 21-speed derailleurs for reliable shifting and front and rear mechanical disc brakes. Its suspension fork 80mm travel provides for a smooth ride over bumps and also increases the quality of your control. It also comes mostly assembled, so you won’t have to worry much about that. All you will need to do is install the pedals, the front wheel, and the handlebar. This mountain bike is great whether you’ve been biking for years or you’re just a beginner. It has a simple yet sturdy build, and it will accommodate you no matter what type of whether you are riding in. You’ll be able to go through tough terrain easily, and your ride won’t be ruined by annoying bumps on the road. The quality of this bike is truly amazing for the price. This bike basically pays for itself, as it will last for years to come and will allow you to have great mountain biking experiences. You’ll love the safe feel of this bike and how it will allow you to push your limits at the same time. This amazing mountain bike has twist shifters with 21 speeds and a great rear derailleur that provides quick gear changes. Its brakes have V brakes to ensure a quick stop, and its 3-piece crank offers wide gear range. Its aluminum frame allows for controlled riding that is still comfortable and easy. This bike can do trails, bike paths, and more! This bike is meant for the roughest mountain biking out there, so don’t be afraid to push both you and the bike to your limits! This bike is designed to give you a fun experience while allowing you to be a great mountain biker. I would highly suggest this mountain bike if you’re looking for something that’s safe and sturdy. You can have a really fun time on this bike but still feel safe and comfortable, which is a huge advantage. Considering its meant for the roughest terrain out there, you know that this bike won’t let you down. It’s reliable, safe, and you will have great time while riding it! You’ve already decided that you want a new bike that you can use for more than just paved pathways and that you’re prepared to go offroading. There are some more questions that you have to ask yourself when you are looking for your optimum mountain bike. Why do you want to start riding your bike now? Are you looking to get serious or is this something that will be occasionally used? A basic model might be good for someone who is looking to use their bike once in a while, but a person that is looking to get more serious may want to get something a little more high-quality than basic. Yes, your physical level will play a role in this, as well. Someone that has back problems or joint issues may want to get a bike with a full-suspension to help them to feel more comfortable. An active person may prefer a hardtail or a full-suspension bike. The different types of mountain bikes include trail, freeride and downhill, all mountain, cross country, and dirt jump. Each of these bikes will have features that will make it valuable to use for these types of rides but don’t think that you need to have more than one bike to take it on different types of terrains. As mentioned before, there are two types of suspensions. There are the hardtail and the full suspension. A hardtail means that the suspension fork is only attached to the front wheel, but this can help with your hand and arm fatigue while improving your control. Full suspension has both wheels suspended, and this may add weight to your bike. You will have more comfort and reduced fatigue overall. It can also give the user better control on difficult surfaces. You should also factor in the cost of your bike in your decision-making process. Most basic bikes will start around a few 100 dollars, but some of the more expensive bikes can be closer to a 1,000 dollars or more. The amount that you are going to use the bike should certainly come into play here as you should probably avoid spending a huge amount of money on a bike that will only occasionally be used during vacations or family bike rides. You can always upgrade your bike later if you start with a basic model now. Want to buy the best mountain bike under $1000? If so, then it is essential that you put into consideration some factors to ensure that you get the best mountain bike that is worth your investment. With many types of mountain bicycles available on the market currently, picking the one that suits your needs sometimes can be a very challenging task. If you enjoy riding, and you need an affordable bike under $1000, then it is important that you get yourself a good mountain bike with all the features you need. In fact, here are the four things you need to consider to make a smart decision when buying yours under $1000 mountain bike. The type of the mountain bike is the primary consideration that every passionate biker thinks about before making a purchase. You are supposed to pick the best type of mountain bike that suits your needs as a mountain bike rider. Nowadays, there are several types of mountain bikes, which are designed in a way that accommodates all mountain biking styles and suitable for a range of terrains. Therefore, if you are in need of mountain bike under $1000, it is necessary that you consider the type of mountain bike that meets your biking needs. The frame materials of a mountain bike determine its durability, weight and the strength. Also, frame materials affect the pricing of the mountain bike; more durable and lighter metals seem to be expensive than durable and heavy materials. So, it is important to consider the frame materials of the mountain bike before buying it, choose a mountain bike which its frame type best meets your biking needs as well as their cost. The sizing of a mountain bike is determined by the size of the frame as well as wheel size. So, when making a decision to buy a mountain bike under $100, you should first test several sizes of mountain bikes in store and go one that fits you well, before buying it. Buying a mountain bike with the right frame size and wheels will enable you to enjoy your mountain biking experience without straining. Every individual has his/her own distinctive features that need to be factored in, before buying a mountain bike. When purchasing a mountain bike under $1000, you should check whether the bicycle you’ve chosen has the features that meet your mountain biking needs. In case you want a mountain bike that has a feature that makes it costly, you can as well buy the one that lacks the feature then purchase the feature on a later date. 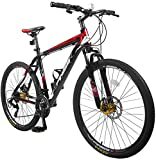 This is a lot of information for you to sort through on your search to find the affordable mountain bike for your uses. It can certainly seem overwhelming when it comes to making such a pricey decision. Each of these mountain bikes is excellent choices, but it is impossible to pinpoint which one will be the exact match for the perfect bike for you. Your size, personal preferences, riding style, and other factors will play a role in determining which of these are the excellent choice for you to make. I suggest that the best way to narrow down your choices is to read over each review again. Take notes on each one about what you like and dislike about each one. Then, start eliminating the ones that have more dislikes than likes. This should narrow your list down. If it needs further narrowing, you can then evaluate which ones have dislikes that you would not be able to get over. Now, you should have a short list of which of these 10 bikes is going to be your next bike purchase. At this stage, you should take into account the prices, colors, and the things you like about each bike on the short list to get your winner.